Moving is more than just transitioning from one space to another. It’s a clean slate in which to write your next chapter upon, and the quality of the moving service that provides you with assistance can set the tone for your new start. 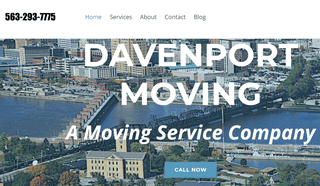 Davenport Moving has been bringing quality services to the Davenport and Cedar Rapids area since we opened our doors, and provide you with the best start to your transition. This is why we put focus into each aspect of our business offerings, from the first point of contact, to bringing you the quotes you need and more. No matter the service need that brings you to our virtual doorstep, you can be sure that we bring you the experience and dedication you need for results.